Why is the Town of Drayton Valley changing its approach to water and sewer rate setting? Currently, the amount of revenue that we collect from water and sewer charges does not cover our costs for this utility. Our prior operational costs did not allow saving for repairs to infrastructure and eventual replacement of facilities. This has result is water and sewer operations being subsidized by all municipal tax payers through property taxes. A further inequity exist in that the small line customers, mainly residential, subsidizing customers serviced by larger lines. The vast majority of customers (94%) are paying, in part, to make up the significant revenue shortfall arising from the rates applied to a small number (6%) of large service and institutional customers. 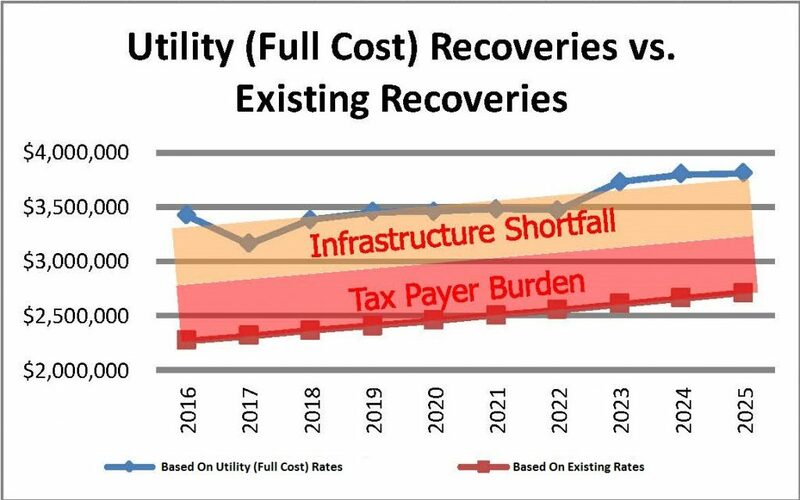 As such, existing water and sewer rates are not sufficient to recover funds needed to meet utility requirements and the Town of Drayton Valley has moved to a Full Cost Utility Rate Setting Approach. If the Town of Drayton Valley continued with previous water rates, a shortfall of $10.30 million over 10 years would result. If the Town of Drayton Valley continued with previous sewer rates, a shortfall of $7.7 million over 10 years would result. The full cost utility rate setting approach will take effect May 1, 2017. I pay utilities at my residential property, what can I expect on my bill? For the average residential customer, this new approach to water and sewer charges will result in an approximate decrease of $0.80 per month in the first year. As a business or institutional customer, what can I expect on my bill? The full cost utility rate setting approach results in fixed charge increases for commercial, industrial and institutional customers that are serviced by large lines. Is there going to be help from the municipality for large service customers to adjust to these changes? Recognizing that the proposed capacity rate change will represent a significant increase for some large service customers, the Town will be phasing in a full cost utility approach over a ten year period. In addition,Town Council implemented a rebate program that will reduce fixed charges for large service customers within Town boundaries. The rebate program for 2017 is a 70% reduction of charge to help facilitate the transition to the new rate system. No, the rebate for those customers who have a line greater than 20mm will be applied directly to their monthly bill. Why is the Town eliminating the capacity/fixed charge for sewer? 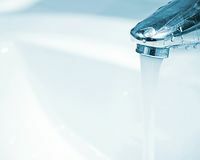 Because a customer’s sewer capacity is not determined by the size of the water service the Town will no longer be charging a fixed rate for sewer. This is in keeping with modern rate setting approaches. Will the rate setting change mean there will be money set aside to deal with rehabilitation and reconstruction? 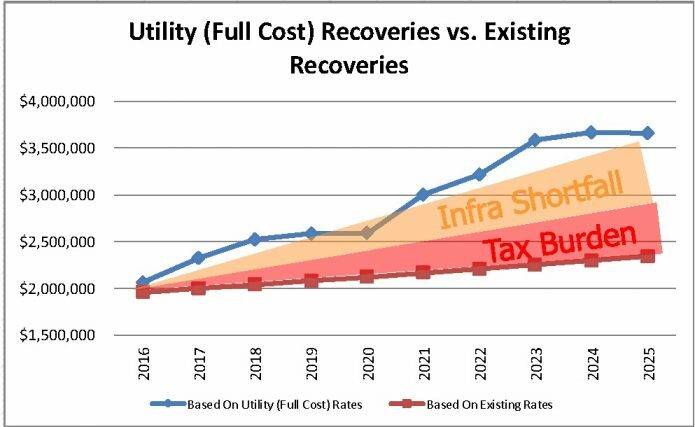 Yes, any monies exceeding operating costs will flow to water and sewer reserves for the purposes of longer-term rehabilitation and reconstruction of utility infrastructure and facilities. A capacity charge represents the water and sewer infrastructure costs associated with providing a customer with their peak water requirements. Water service infrastructure includes: water treatment, distribution of water through transmission lines and a local distribution system, fire protection through the local water distribution system, collection and transmission of waste water and waste water treatment services. As part of the fixed charge, the amount of the capacity charge is determined by the size of water service entering a customer’s premises. What is the administration/billing charge for? The monthly administration charge represents the cost to read meters, create and to administer utility accounts. This cost is included in the fixed charge and will not be billed separately. What does the fixed charge on my utility bill represent? The fixed charge is the capacity charge based on line size servicing the property and the monthly administration/billing charge. If I have questions, who can I call?